From visibility to credibility, going to trade shows provides many benefits for your business. 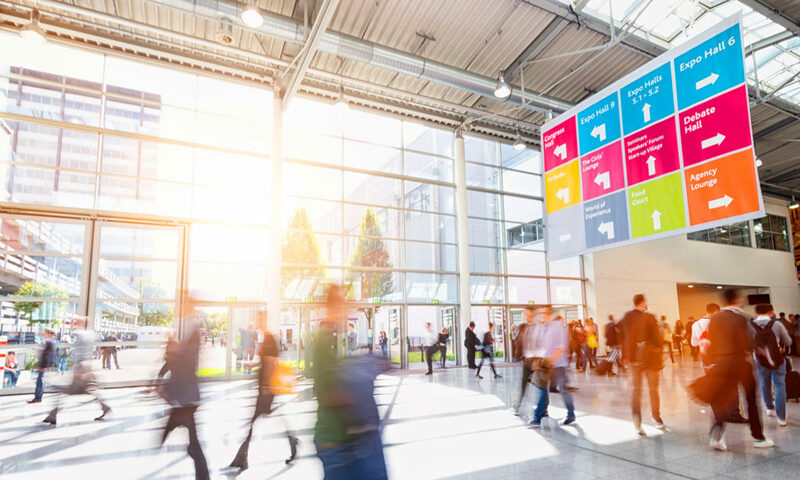 Creating a company presence, big or small, at a trade show is a great way to meet new customers, reach out to your existing customer base, and develop your brand. Trade shows give you the opportunity to gain highly targeted leads and market your products to a larger audience. Every trade show is an opportunity to broaden your company’s customer base. Trade show attendees are usually interested in the products and services being offered at that specific trade show. Attendees are more willing to close a deal on the spot than other potential customers. Branding is a huge part of a business’s success, especially in industries that depend on trust and reputation. Displaying your business at a trade show can show that your company is large enough to afford a spot along with industry leaders. You will gain more attention when you place yourself near the more recognizable brands. Trade shows are great opportunities to reevaluate your business. Trade shows allow you to see what’s working (and what isn’t). You have a chance to see which way the industry is moving and plan your next move. Knowing the current trends can give you, and your business, a step up that most of your competitors will not take advantage of. Displaying your company appropriately at a trade show is also very important. Having an interactive display will stick with the potential customers far longer than a static display. Let visitors have a hands-on experience with new equipment and software and tell them about exciting changes coming to your product. As technology continues to change in the industry, the booths that feature software and business systems will be the busiest. Whether you’re looking for a new business system or not, you will find technology specialized for your business. Adding specialized software/systems to your business can be a gamechanger. Customers are always looking for the next best thing. If they see you using the latest technologies, they will be more interested. Much like with tools and equipment, trade shows give you the opportunity to test software programs. You have the opportunity to learn about the features and benefits of each option and how it might work for your business. Networking is one of the most important reasons to go to trade shows. Go out of your way to spark conversation and initiate a relationship. They may need your products and services or be in a position to refer you to others. Trade shows, big or small, can get your name out to many different people. This is also a great way to find not only potential leads, but also potential business partners. Networking is a great way to get advice or recommendations for the problems you may be facing. It’s always helpful to learn the best practices others are using to allow your business to develop and grow to its full potential. Remember that making a trade show experience a success doesn’t end when the trade show is finished. A trade show is a source of leads, not clients. Follow up on all of your leads with phone calls, and put the names on your newsletter, direct mail and/or e-mail list. Take plenty of time to prepare. Trade shows are a big investment. Make it worth it for you and your business. Attending trade shows is an incredible opportunity to improve your business. Have the right mindset and get the most out of the event! To learn about upcoming trade shows, check out lists here and here!